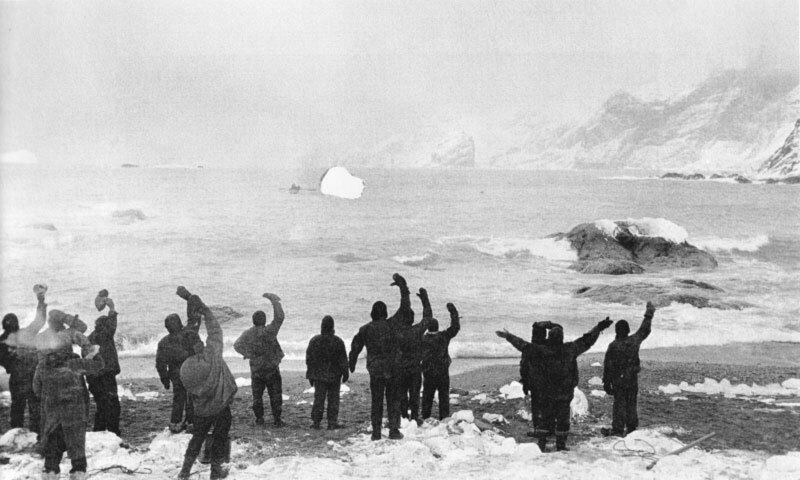 In 1914, a band of seasoned explorers set out for the last continent on earth, Antarctica. Their goal, to traverse the unmapped interior. Their plan, a pincer movement advancing from the Ross and Weddell seas. Their route, to pass the South Pole on their way to the unknown. They never made it. This is their story. Sir Ernest Shackleton, like many in the Heroic Age of Exploration, felt the magnetic pull of the South Pole. In 1901 he was a member of Scott’s Discovery Expedition, but dreamed of heading up his own. In 1907-09 he made that dream come true: Shackleton’s Nimrod Expedition managed to reach the furthest point south to date, only 112 miles from the Pole. Upon return he was fêted as a hero, and immediately commenced an intensive lecture tour; expeditions like this were funded as much by the imaginative needs of the armchair traveler, as by the financial investments in hoped-for natural resources. “National glory” (and its subsidiary, “personal glory”) were the brands under which an argumentative assortment of real and virtual desires jostled for recognition. And yet. The Pole still beckoned, just out of reach. Shackleton hatched the idea for the Imperial Trans-Antarctic Expedition after his chance to claim the South Pole for himself (and for England) was dashed in 1912 by Roald Amundsen, who did return, and then Robert Scott, who didn’t. But the Antarctic continent had barely been penetrated, never mind truly explored. After lengthy, arduous, yet ultimately successful, rounds of fundraising, Shackleton recruited another crew, acquired a new ship, and made preparations to head south again. Upon reaching the whaling station at South Georgia Island, the final stop in civilization, Shackleton was informed that the pack ice had extended unusually far north that year, and in fact, The Endurance encountered the pack only two days out of port. And The Endurance itself, despite being specifically designed for polar regions, had a feature that the thickening pack ice would soon turn into a flaw. Our world of constant contact was unimaginable back then. Once the ship left South Georgia, they were offline, completely. Meanwhile, unbeknownst to the expedition, WWI had metastasized from just another European conflict into The Great War. It is unclear whether, had they been able to get a signal through, help could have been diverted from the war effort to go and get them. They were on their own. For scientific leadership, give me Scott; for swift and efficient travel, Amundsen; but when you are in a hopeless situation, when there seems to be no way out, get on your knees and pray for Shackleton. Join the expedition. Follow Shackleton’s journey on Twitter: @EShackleton.